Since July 1, I've scouted 60,000 acres of potential hunting land for the coming fall. That’s pretty good productivity, if I don’t mind saying so. I’ve eliminated most of those acres at a glance because they simply lack the habitat and terrain elements I'm trying to find. But others seem to have the right stuff. Now I have a notebook with two dozen potential stand locations, along with notes about likely patterns of deer movement, notable terrain features and mapped out trails ready to plug into my GPS unit so I can find the “spot on the spot” after leaving my truck. All of this has been done without ever leaving my office. Google Earth, my deer hunting friends. It has absolutely changed the way that I hunt. And I bet it can help you as well. First, a little background. I’m a Do-It-Yourself type of hunter, both by choice and necessity. Around 60 percent of my hunting this fall will be done on public land. The rest will be on small pieces of private land in heavily-hunted areas. To kill deer, I have to find areas that concentrate deer movement while offering some measure of relief from hunting pressure. In other words, I’m going to hunt places where deer feel comfortable, and where terrain features force them to walk. And all of this can be done using Google Earth and Google Maps. Most people have used Google’s mapping system at some point, if only for directions while on vacation. But if you haven’t, go to Google.com and type in the name of a location, such as your hometown. On the right-hand side of the results page, you’ll likely see a map of the area. Click on that and you’ll be sent to Google Maps. Depending on how your Google preferences are set, you’ll see either a standard map that shows roads and bodies of water or a full-featured aerial image. For scouting, you’re most interested in the aerial “satellite” view. If you don’t see it, click on the box in the upper right corner that allows you to toggle between the “map” view and the “satellite” view. The satellite imagery will not only show you roads, but will also show you an aerial image of the area you intend to hunt. And that’s where the magic begins. Using the basic Google Maps system, you’ll be able to zoom in on your intended hunting area and see a ton of detail. Is it wooded? Are there crops? How many access roads are there? Google Maps, on its own, will give you a great start on long-distance scouting. But it’s just the tip of the iceberg. To really dive in and do some serious scouting, you’ll want to install Google Earth. It’s a free download, and you can get it here. 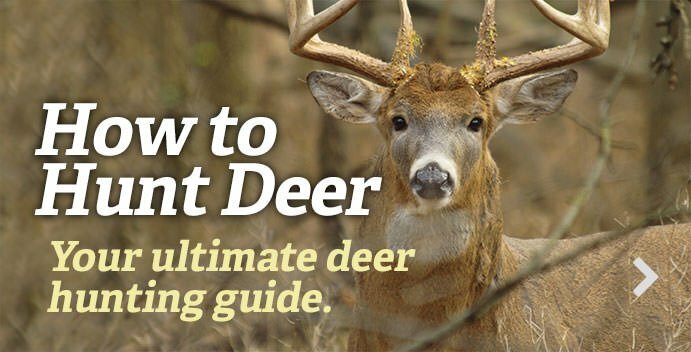 Once installed, you can start honing in on spots to kill a deer this season. In the upper left corner of the Google Earth window, you’ll see a “Search” area. Again type in the name of a location near where you intend to hunt. If you’re hunting a state game area or other public area, you should be able to type in the name of the location and the system will zoom right to it. Learn Topography Once you’ve found the general area you wish to look at, zoom in. The system will act very much like Google Maps did. But, once you’ve zoomed in to a certain level, the perspective of the map will change, and you’ll be given a three-dimensional view of the area’s topography. Using the adjusters on the upper right of the map, you can change the angle and viewing level to really get a feel for the lay of the land. Scouting areas with hills, hollers and mountains has never been simpler. Much of the area I’ve been looking over this summer, for example, is located in southern Ohio, a hilly, holler-filled place. Finding saddles and benches is critical to finding areas of key deer movement. Using Google Earth’s 3-D imaging, I’m able to locate those features without hiking miles and miles of rugged terrain. Mark the Sweet Spots Google Earth allows you to mark locations with a digital push pin and save them for future reference. Each pin will also tell you the exact longitude and latitude coordinates for that location. You can take those coordinates, plug them into your GPS unit and walk right to the spot, even in the dark. Measure Distances Familiarize yourself with the system’s tools. It’s incredibly worth it. They make long-distance scouting more productive and simpler. For example, I use the system’s “Ruler” tool all the time. Simply choose the tool, choose the unit of measurement you want to use (miles, yards, feet, etc) and then click on your starting point. Now drag the ruler line to your destination. The ruler will measure the distance as you move. It’s an invaluable tool for determining how far the hunting area you’ve selected is from all potential access points. And, with your preferred route of travel marked, zoom in to the 3-D image view level. Rotate the screen around a bit and you’ll see the line you drew will lay to the contours of the land. This will tell you exactly how many hills you’ll be climbing on your chosen path of travel. Map with Your Phone All of these tools are certainly handy. But what if you want to look at an aerial image on your phone while you’re actually on the ground? One option is to simply install and open the Google Earth app on your phone, where you’ll be able to access the same 3-D imagery and many of the same tools. In areas with solid cell coverage, the app will zip right along. But if the coverage is spotty, be aware that it takes time to download the imagery, and your battery won’t last long. The better, faster option for many remote hunting areas is to create a custom map overlay ahead of time on your home computer (or at work, so long as the boss isn’t watching), export that file, e-mail it to yourself, and then open the file in Google Earth on your phone while you’re in an area with good service. Once the map is open, you should be able to use it anywhere. To do this, save the locations that you’d like to transfer in Google Earth on your home computer, and then simply right-click on the selections in the “My Places” area (it’s on the left side of the screen) and click “save as.” Be sure to choose the .KML option if you’ll be using the file on an iOS device. Last fall, I got permission to hunt a new area that I’d never seen before. The landowner told me the parcel’s boundaries weren’t marked very well. So, using a copy of the county plat map as reference, I used Google Earth to draw the boundary lines. I saved them in the “My Places” section, exported the file, and then e-mailed it to myself. Upon arriving at the location, I simply downloaded the .KML file from my e-mail, opened it in Google Earth and bingo, I had my own custom boundary map. As I walked around the property, the Google Earth system showed me where I was, and the red boundary lines I had created were clearly visible on the map. Google Maps and Google Earth may seem like fairly simple systems to use. Aerial photos, after all, are time-tested scouting tools. But the options and power behind these digital scouting devices is awesome. There are far too many uses, tips and tricks that I’ve learned along the way to cover them all here. In fact, I’m still learning something new every time I use it. But this should get you started, and I suspect you’ll soon wonder how you ever scouted without them.